Today is Yom Hashoah, the annual day of remembrance for victims of the Holocaust. While it is still morning it has already been the most meaningful Yom Hashoah experience for me. I actually had a feeling that Yom Hashoah 2013 wouldn't be like past experiences. On Thursday, February 7 of this year the Shoah hit me like never before. I was freezing cold as I stood over the ravine at Babi Yar in Ukraine with two dozen of my rabbinic colleagues. Our shoes sunk into the snow as we stared out into the forest where 33,771 Jews were killed in a single operation between September 29–30, 1941. This was not my first visit to Babi Yar. I had visited there eight years earlier, but this time was different. I have visited concentration camps and seen gas chambers, but this was different. Our brief memorial program consisted of lighting candles, throwing flowers into the ravine, reading poems, singing songs and reciting prayers in tribute to the memory of those who perished on that site. But it was the music that did it for me. So too was the case for me yesterday in the late afternoon. It was the music. My friend Hazzan Daniel Gross, the cantor at Adat Shalom Synagogue, is a gifted opera singer, composer and musicologist. The grandson of Holocaust survivors, Dan recognized there was a need for a Yom Hashoah liturgy so as part of his senior presentation in the H.L. Miller Cantorial School of the Jewish Theological Seminary he wrote one. According to Wikipedia, "In response to the lack of liturgy dedicated to Yom Hashoah, Daniel Gross composed, in 2009, I Believe - A Shoah Requiem, a complete musical liturgy dedicated to the observance of Yom HaShoah. An a cappella oratorio scored for cantor, soprano solo, adult chorus and children's chorus, I Believe features several traditional prayer texts such as the Mourner's Kaddish (Kaddish Yatom) and the El Malei memorial prayer, and also includes the poetry of Paul Celan and Primo Levi. On April 7, 2013, I Believe will have its World Premiere presentation at Orchestra Hall at the Max M. Fisher Music Center in Detroit, Michigan. An excerpt from this oratorio, Kaddish Yatom, was performed earlier at the Rykestrasse Synagogue in Berlin during the 2012 Cantors Assembly Mission to Germany." Sitting at Orchestra Hall in Detroit yesterday I was blown away. There are simply no words to describe the atrocities of the Shoah. There are no explanations. It is so challenging to even know what to feel. That is why my second visit to Babi Yar was so much more powerful than my first. It was the singing. And that is why Hazzan Daniel Gross has presented such an important gift to the world with his Yom Hashoah liturgy. 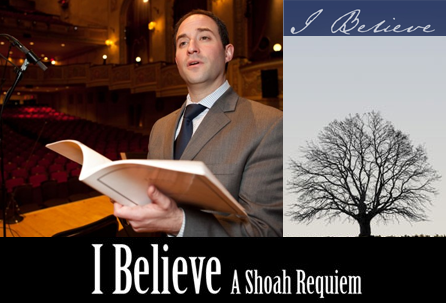 The combination of cantorial music, sopranos and children's choir was chilling, but at its core was the message of "I Believe" which brings hope. And that was the connection I drew between yesterday's musical tribute to the victims of the Holocaust and my soul stirring experience at Babi Yar two months ago. Ani Ma'amim -- I believe. As our tour bus approached the Babi Yar site, we drove around a neighborhood which had been predominantly Jewish before the war. One of the rabbis on our Federation mission grabbed the microphone and asked the bus driver to stop in front of an old apartment building. Rabbi Tina Grimberg is a Reconstructionist rabbi from Toronto and the author of Out of Line Growing Up Soviet, an autobiographical work presenting her view of the life of a young Jewish girl growing up with her family in Kiev in the 1960s and 1970s. Tina was born in Kiev and told us the shocking history of her family in that apartment complex, which was just minutes from Babi Yar. She spoke of the crowded living conditions without any privacy, the hunger and the hopelessness. She then told us of her grandfather's strong belief that redemption would come. As a symbol of that yearning for redemption, he tended to a rose bush in front of the apartment. Tina explained that this was his way of shouting out to God, "Ani Ma'amin". He held hope against the reality of the suffering of the Jews. As we exited the bus at the Babi Yar site Tina gave each of us a single red rose to carry along the path to the ravine. We then threw the roses into the ravine as we sang a long, slow, dirgeful version of "Ani Ma'amin". Babi Yar, like all of the killing fields, death camps, mass graves, and gas chambers, should not only be a holy place of memory. It must also be a place of eternal hope and belief. The Jewish people have endured despite the unspeakable. In his introduction yesterday to I Believe - A Shoah Requiem, my teacher Rabbi Daniel Nevins told the story of when he asked my teacher Cantor Larry Vieder, of blessed memory, how after everything he endured during the Holocaust and then as a partisan fighter he could have so much faith in God. "If I gave up faith, what good would that do for me?" he replied. And that is why it is imperative that we not only grieve for the millions of martyrs of the Shoah, but we also proclaim "Ani Ma'amin -- I believe" in their honor. I am grateful to Hazzan Daniel Gross for focusing on that theme in I Believe - A Shoah Requiem and providing us with a beautiful, spiritual and deeply moving musical liturgy for Yom Hashoah.